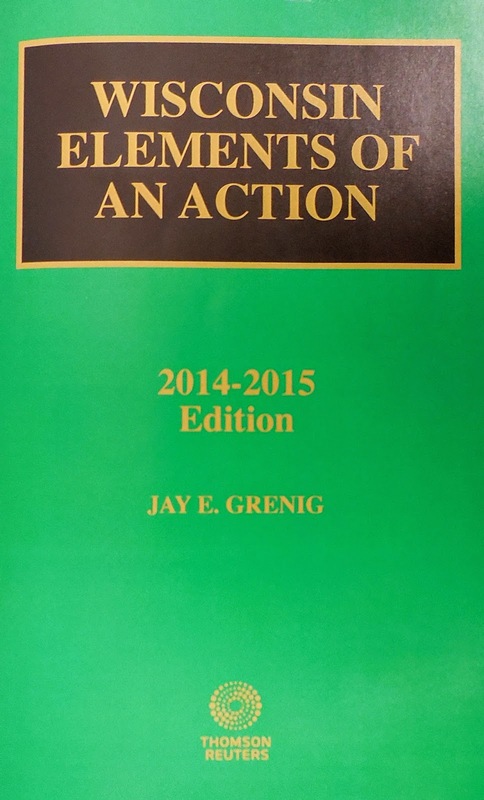 Elements of an Action is a single, unobtrusive volume in the larger set of green Wisconsin Practice Series books on our shelves. Professor Jay E. Grenig with Marquette University Law School writes this book. The 2014-2015 edition has seventeen chapters devoted to frequently litigated civil causes of action. Each chapter is broken into a survey of statutory and other elements underpinning the action, statutes of limitations, claims, remedies, and defenses. References to Wisconsin Jury Instructions and jury verdicts are included as well as additional case studies for many chapters. Each action includes example forms and other documents from recent Wisconsin court cases.